Follow Mumbai Heroes vs Kerala Strikers live streaming T20 CCL 2015 5th match, ball by ball live MH vs KS cricket commentary and live updates. Also get Kerala Strikers vs Mumbai Heroes live scorecard match Prediction, team members and live TV channel broadcasters information. Mumbai Heroes vs Kerala Strikers Live score, match summary. 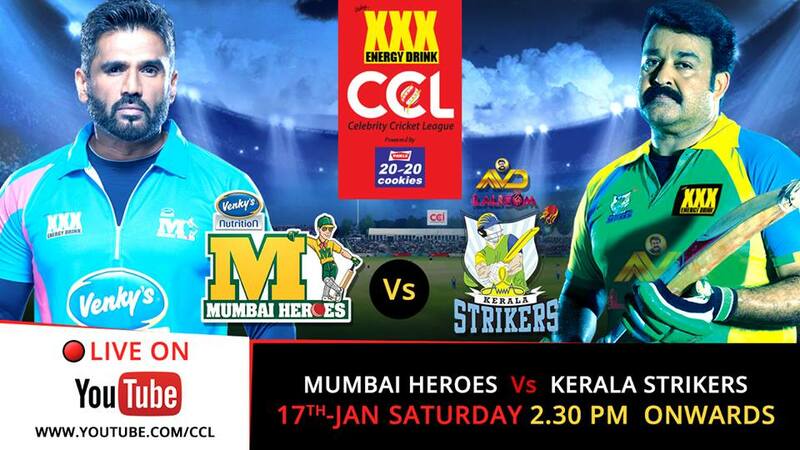 Mumbai Heroes vs Kerala Strikers Live score, match summary, ball by ball commentary. Mumbai Heroes vs Kerala Strikers full scorecard. Live Streaming video will be updated just before the match starts. This match between Mumbai Heroes and Kerala Strikers will be live broadcast on Colors TV and Gemini TV in India, South Indian territory. On the other side the official channel of CCL on Youtube.com is also broadcasting the entire tournament across the world. The 5th T20 of Celebrity Cricket League 2015 is scheduled between Mumbai Heroes and Kerala Strikers in Ranchi at 02:30 Local Time. Mumbai Heroes after a sensational victory are eyeing the next match against Kerala Strikers. On the counter side, the loser of previous match is ready to quit their defeated scenario in the next game against Mumbai Heroes. This is the 2nd match of both teams and 5th of the CCL 2015 is to be registered as well, both the skippers are fully aggressive to take on each other. Mumbai Heroes chased down the mighty target in a breath taking match held between Mumbai and Veer Marathi on 10th Jan, 2015. On the other hand, the 2nd opposition of 5th T20 Kerala Strikers was unable to take on former Champion Chennai Rhinos to take on in all directions. Chennai Rhinos defeated the Kerala Strikers with huge margin and they got bonus point which could help them in upcoming meetings of the event. No doubt that Mumbai Heroes snatched victory from Veer Marathi, but that was an excellent showoff literlay because they picked the triumph in a breathtaking match during one ball boundary. Mumbai Heroes got a match winning combination in which they have bowlers, batsmen and perfect all rounders who are able to change the momentum of game as they did in the previous match against Veer Marathi. Bobby Deol proved his captaincy a toughest challenge for the opposition in the previous game, after the replacement of Suniel Shetty, Bobby has done a great job for the team. Although he did not play a match winning innings, but guided and led the team into positive direction. Sohail Khan, Suniel Shetty made their normal appearance in the team, Aftab also contributed well on the other side Sonu Sood, Saqib Saleem and Rohit Roy will be tested once again to show their qualities. Sami Kochhar, Vatsal Sheth, Amit Purohit and Raha Bherwani are also in the team stand at front line. There is a line of all round cricketers in the team who will put their display in the match against Kerala Strikers. Varun Badola, Apoorva Lakha, Shabir Ahluwalia, Ranjeesh Duggal and Jay Bhanushali are the original all rounders in the team who are going to participate in the next match scheduled to be played at Ranchi. Mohan Lal, the captain of Kerala Strikers who is an all rounder is leading the team by playing a vital role of leading from the front. Kerala Strikers started the event on defeated notes, but they are now hungrier to make their comeback in this match by beating Mumbai Heroes. Kerala Strikers got only two bowlers in their team, Asif Ali and Unni Mukundan are the two only and genuine bowlers in the team, but Kerala Strikers acquire too many all rounders like Rajeev Pillai, Bineesh Kadiyeri, Arjun Nandakumar, Vinu Mohan and Suresh Nair. This team does not have some sort of extra or substitute characters in their team having playing XI in which two genuine batsmen are added. Bobby Deol (capt), Suniel Shetty, Aftab Shivdasani, Bowlerrandeep Hooda, Armaan Kholi, Kabir Sadanand, Varun Badola, Yash Tonk, Shabir Ahluwalia, Jeetu Varma, Indraneil Sengupta, Wkapoorva Lakhia, Samir Kochhar, Sonu Sood, Aditya Roy Kapur, Bowleramit Purohit, Vatsal Sheth, Raja Bherwani, Zayed Khan, Bhupinder Singh.